“Firsts are best because they are beginnings” is a phrase that could well be one of FIU’s mottos as a Worlds Ahead institution. Another first FIU can now claim is the appointment of Yuk Ching Tse Dinh as the first woman at FIU to achieve a top leadership position in research as director of an Emerging Preeminent Program, the Translational Molecular Discoveries (TMD) program in the Biomolecular Sciences Institute (BSI). This prestigious designation recognizes university programs that have greatly contributed to FIU’s status as a top-tier research institution. The goals of the TMD program are to engage with internal and external partners in making new discoveries resulting in patents, increased funding for research and the integration of those discoveries into real life practices and treatments. Being a first is familiar territory for Tse Dinh. Of the 32 first-year students enrolled in her chemistry Ph.D. program at Harvard University, only one other person besides her was a woman, and she left the program after the first year. Tse Dinh tried to not let that bother her. Tse Dinh has spent her career focused on studying DNA-protein interactions at the molecular level. She first became interested in biological chemistry as an undergrad at Hollins University, when, during a biology course, she became fascinated with the ways in which relatively small proteins interact with much bigger chromosomes to control the information output from the genome. Her work focuses on genome structure, and specifically topoisomerases, enzymes that regulate the winding of the DNA helix. The double-helical structure of DNA can cause certain topological problems, and so topoisomerases manipulate DNA in order to prevent and solve these issues. The study of topoisomerases directly affects advancements in the fields of health and medicine. Tse Dinh came to FIU in 2012 to lead the BSI, which officially launched in 2014. It is a multidisciplinary group of FIU researchers and educators who partner with community institutions to “seek innovative solutions for improving individual health and wellness.” Research areas include mosquito-borne diseases such as Zika and malaria, antibiotic-resistant bacteria, and cancers and neurological disorders, all at the molecular level. 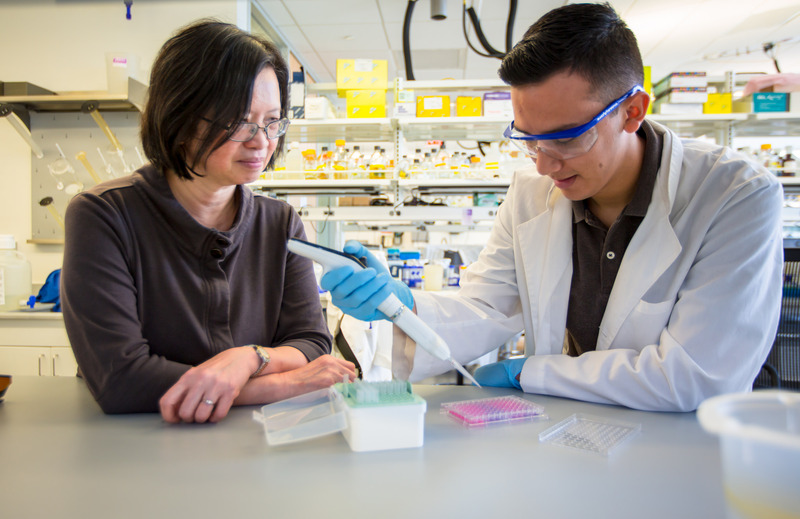 The opportunity to mentor the next generation of scientific researchers was another attraction that drew Tse Dinh to FIU. “It’s very satisfying to see their growth, from the time they enter the program to the time they leave, both in personal traits required for a research team member, and in their ability to perform independent research,” she says. Mentorship is important to her because she knows firsthand the value of having strong and supportive advisors. One of her chemistry professors at Hollins had previously worked at the Los Alamos National Laboratory, and helped her land a summer internship at Brookhaven National Laboratory, a renowned institution whose focuses include nanoscience and environmental and bioscience. Part of her goals for the TMD program is to help students gain real research experience, so that they continue their studies and/or find work in the field. “It’s exciting to play a significant role in training biomedical research workforce,” Tse Dinh says. Tse Dinh is also focused on advocacy for women in the sciences. For example, at a major conference she attended last year, she was concerned with the lack of women as featured plenary speakers, and made a point of letting the organizers know. When the program for this year’s conference was announced, there was a marked increase in the number of female speakers. More recently, she spoke at a Gordon Research Conference (GRC) Power Hour. The GRC is a prestigious scientific organization dedicated to building communities that advance the frontiers of science, and the GRC Power Hours are sessions that that give attendees the opportunity to discuss challenges women face in science. She was elected vice-chair of the Frontiers of Science Gordon Research conference for 2020, which means she will become chair in 2022.